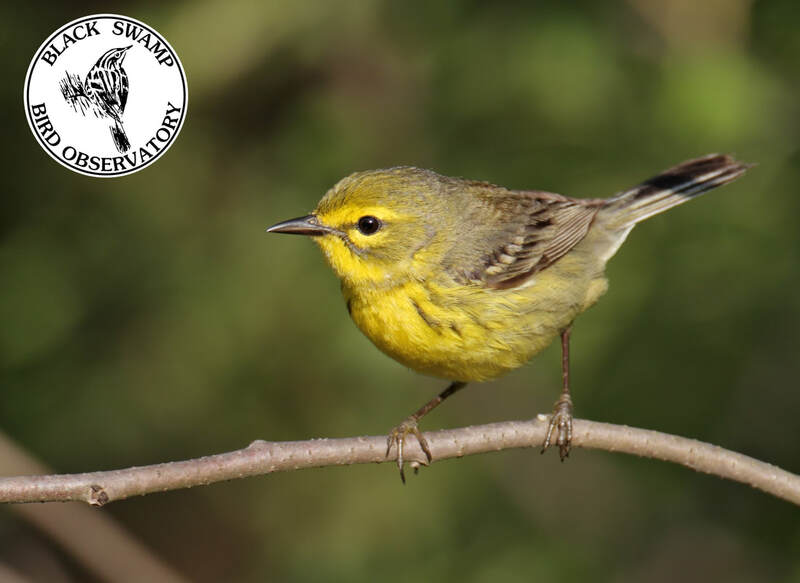 #WarblerWednesday is a social media campaign aimed at educating the public about warblers while showcasing Black Swamp Bird Observatory's 30+ years of migration research. Each post on social media is made every Wednesday with the hashtag #WarblerWednesday. To see these posts, search the hashtag on Facebook or Twitter! Posts will also be logged here for education purposes. Identifying characteristics: This bird is often a favorite warbler for beginning birders as it is easy to see and easy to recognize. It was once known as the "Black-and-white Creeper," a name that describes its behavior quite well. Like a nuthatch or creeper (and unlike other warblers) it climbs about on the trucks and major limbs of trees, seeking insects in bark crevices. It often feeds low, and nests even lower, usually on the ground. Creeps along branches. Speckled undertail. Male bold with black face patch and throat. Female with grayish face patch and throat, and buffy flanks. Preferred habitat: Woods; trunks, limbs of trees. Breeds in mature or second-growth forests, deciduous and mixed. Often in woods on dry, rocky hillsides and ravines. Also nests in dry portions of wooded swamps. In migration, seen most often on trunks and low branches of trees within woodlands and thickets. In winter in the tropics, found in trees from sea level to high in the mountains. Song: A thin, high-pitched, monotonous weesy-weesy-weesy-weesy, like a squeaky wheelbarrow. NW Ohio migration fact: In the spring, the Navarre Banding Station banded 65 BAWW in 2018; the first bird showing up on April 30. Peak spring migration for BAWW occurs in the first to second week of May. In the fall of 2018, 15 BAWW were banded with the last bird recorded on October 12. 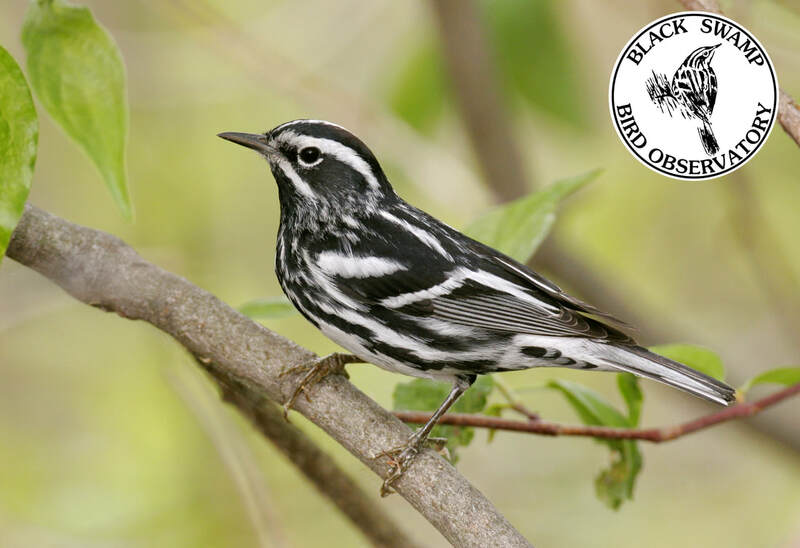 Cool fact: The Black-and-white Warbler is the warbler that is in the logo for Black Swamp Bird Observatory as it was once a common breeder in the marshy regions of NW Ohio. Information provided by Lives of North American Birds by Kenn Kaufman and Black Swamp Bird Observatory. Photos courtesy of Brian Zwiebel. 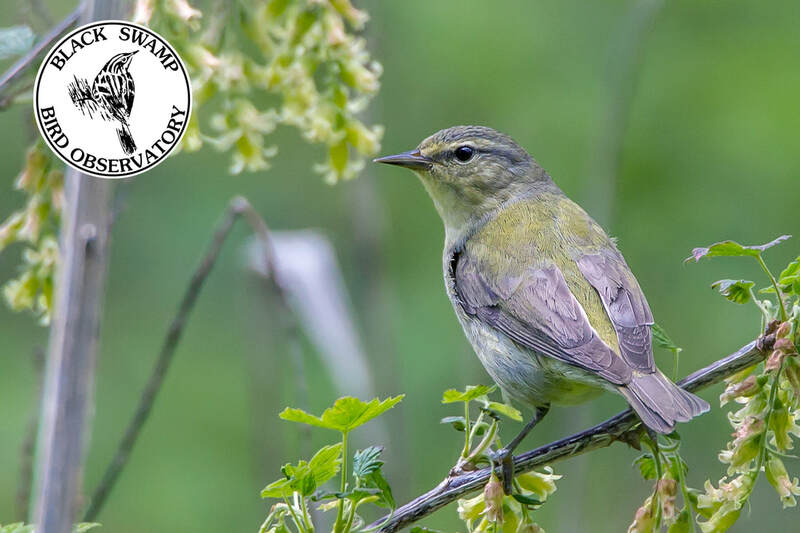 Identifying characteristics: The lazy, buzzy song of the Black-throated Blue Warbler comes from the undergrowth of leafy eastern woods. Although the bird usually keeps to the shady understory, it is not especially shy; a birder who walks quietly on trails inside the forest may observe it closely. It moves about rather actively in its search for insects, but often will forage in the same immediate area for minutes at a time, rather than moving quickly through the forest like some warblers. Low to mid-level forager. Male blue above with black face, throat, and sides. Female pale blue-green with light “mascara” above and below eye. Both sexes show white “handkerchief” in flight feathers. Preferred habitat: Interior of hardwood and mixed deciduous-coniferous forests. Breeds in large areas of relatively undisturbed forests of maple, birch, beech, eastern hemlock, spruce, and fir; mainly forest containing a dense undergrowth of shrubs and vine tangles. Northwest Ohio migration fact: In the spring of 2018, the Navarre Banding Station banded 41 BTBW with the first bird showing up on May 1. In the fall of 2018, 77 BTBW were banded with the last being October 17. 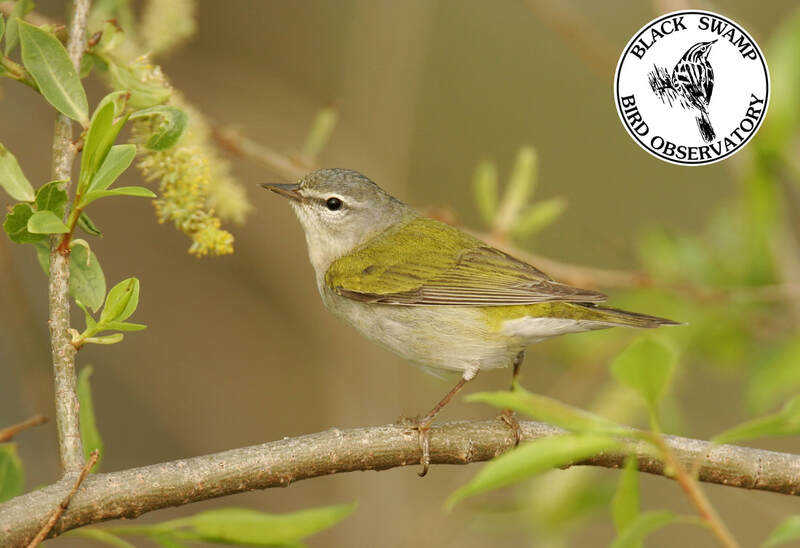 Cool fact: Unlike many other warblers, juvenile BTBW males and females (after fledging and following their subsequent molt) are nearly identical to their adult counterparts. Information provided by Lives of North American Birds by Kenn Kaufman and Black Swamp Bird Observatory. Photos by Brian Zwiebel. Identifying characteristics: A fiery gem of the treetops. During the breeding season in northern forests, the male Blackburnian Warbler may perch on the topmost twig of a spruce, showing off the flaming orange of his throat as he sings his thin, wiry song. The female also stays high in the conifers, and the nest is usually built far above the ground. Long-distance migrants, most Blackburnians spend the winter in South America, where they are often common in mountain forests of the Andes. Canopy forager. Male with orange throat, black face triangle and side streaks, and bold white wing patch. Female similar with pale orange-yellow throat, gray markings, and two wingbars. Preferred habitat: Woodlands; conifers in summer. Breeds in boreal coniferous and mixed forests, especially spruce and hemlock. In southern part of breeding range in Appalachians, can inhabit completely deciduous forests. When migrating, occurs in all kinds of trees and brush. During winter in the tropics, is usually found in humid mountain forest. Song: High, thin zip-zip-zip-titititi-tseeee ending on a high note. Ohio migration fact: In the spring, the BSBO Navarre Banding Station captured 52 BLBW this year. Peak spring migration typically occurs around the second week of May. In the fall, seven BLBW were captured this year; the last being on September 26. Cool fact: In courtship, male sings and performs displays with gliding flight and fluttering wings and tail. Information provided by Lives of North American Birds by Kenn Kaufman and Black Swamp Bird Observatory. Identifying characteristics: Adult male breeding: black cap, white cheeks, bold streaks on upperparts and underparts, white wingbars. Adult female breeding: head and upperparts olive-grey, with faint indication of male’s head pattern, streaking less bold. Adult male non-breeding: head and upperparts olive-green, lemon-yellow throat and breast contrast with white lower underparts, distinct streaks on upperparts and sides. Adult female is similar, but averages less heavily streaked especially on sides. Preferred habitat: Breeds in spruce forests, uses all types of woodland on migration. Winters in lowland tropical forest and forest edges. Song: The Blackpoll’s calls are virtually identical to the Bay-breasted Warbler and, like that species, very rarely gives the “chip” call. The Blackpoll’s song is a rapid series of extremely high-pitched “si” notes, often sounding slightly staccato. 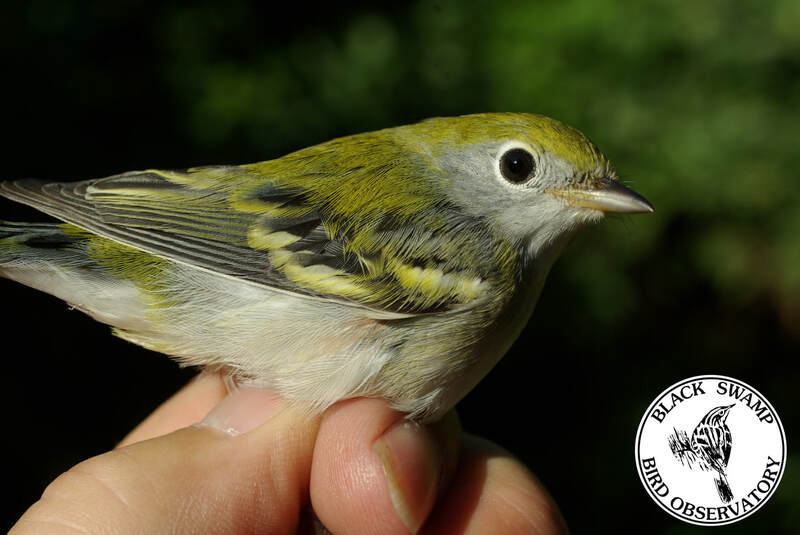 Ohio migration fact: During spring migration, the BSBO Navarre Marsh Banding Station, on average, bands 72 Blackpolls. During fall migration, the station, on average, bands 546 per season. This makes the Blackpoll Warbler the most common species at the station during fall migration. Cool fact: BSBO bands more Blackpolls than any other research station. The Western Basin of Lake Erie may be one of the most important staging areas in North America for this species as our banding totals far out-pace other parts of the country. There is also some discussion that Lake Erie maybe a jumping off place for Blackpolls to start their trans-Atlantic flight to South America with the mass of research we document each fall. 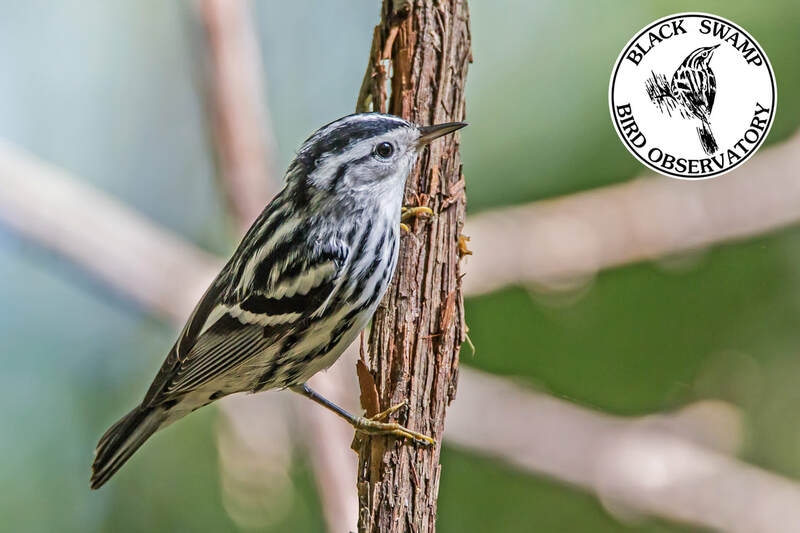 BSBO has initiated the formation of an International Blackpoll Warbler Working Group with the goal of improving the accuracy of major reports on population trends of many birds. Our goal is to convince the authors of these studies to include migration data with the Breeding Bird Survey data currently used to determine population trends. 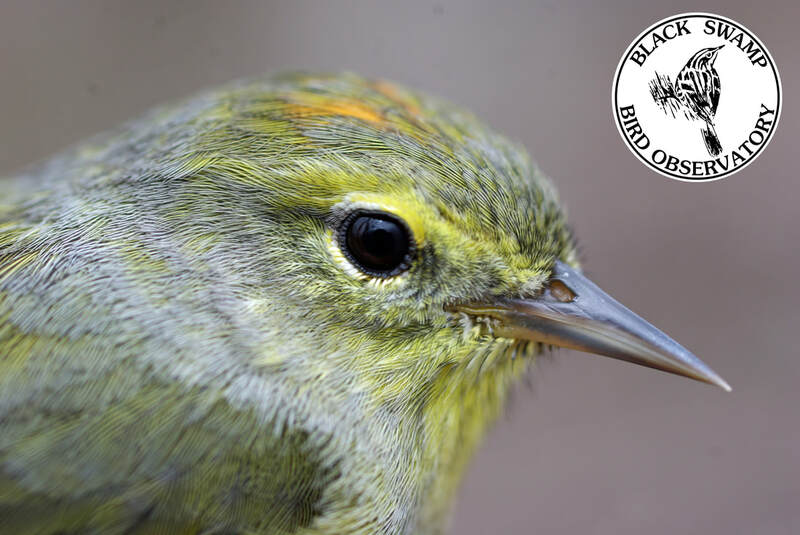 BSBO is using the Blackpoll Warbler as the flagship species for this initiative. Identifying characteristics: Male with white throat, blue back, and blue-black “necklace”. Female pale blue-green with yellowish throat and breast, and pale eyebrow. Preferred habitat: Deciduous forests, especially in river valleys. Breeds in mature hardwoods either in uplands or along streams. Prefers elms, soft maple, oak, birch, hickory, beech, basswood, linden, sycamore, or black ash. In winter in tropics, found mostly in forest and woodland borders in foothills and lower slopes. Song: Series of short buzzy notes, followed by a higher-pitched buzz. 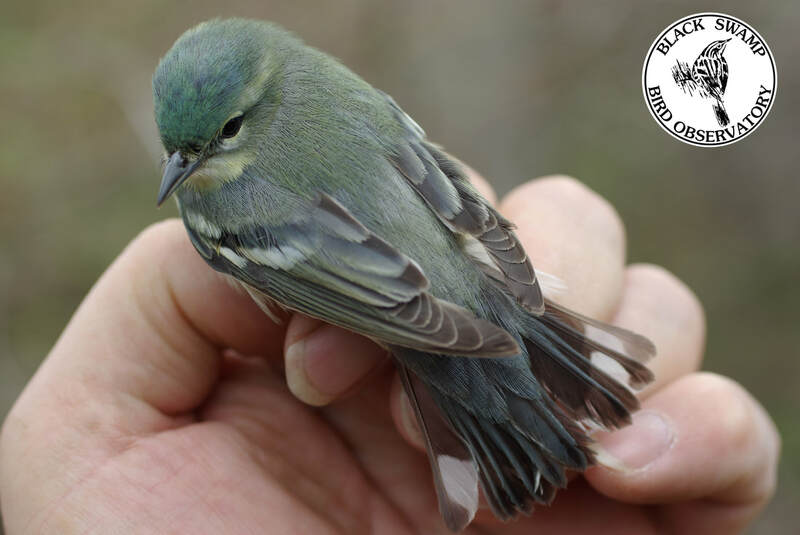 Ohio migration fact: Cerulean Warbler captures are very rare at the Navarre Marsh Banding Station! In the fall, only one has been banded at the station. In the spring, they average two a banding season, peaking May 9. Important fact: Surveys show strongly declining numbers in recent years. Nesting efforts may fail because of increasing cowbird parasitism in smaller patches of forest. May also be losing wintering habitat in tropics. Identifying characteristics: In breeding plumage, the combination of yellow or yellowish crown, black eye-stripe and mustache, and white underparts with chestnut along breast sides and flanks is distinctive. Underparts olive-green, heavily streaked black; two yellowish wingbars. All breeding birds show this pattern; males are brightest, with yellower crown, stronger face pattern and more chestnut on sides, while first-breeding females can be quite dull. Preferred habitat: Breeds in young second-growth deciduous forest, brushy thickets and abandoned farmland that is reverting to forest. Uses any wooded areas on migration but mainly deciduous. Winters in second-growth forest, especially edges and clearings. Song: The common song is a series of loud whistled notes with a terminal flourish, often transcribed as "pleased, pleased, pleased to meech". Also has a different song, heard mainly later in the season, which has the same basic quality but is longer, less emphatic and more variable. 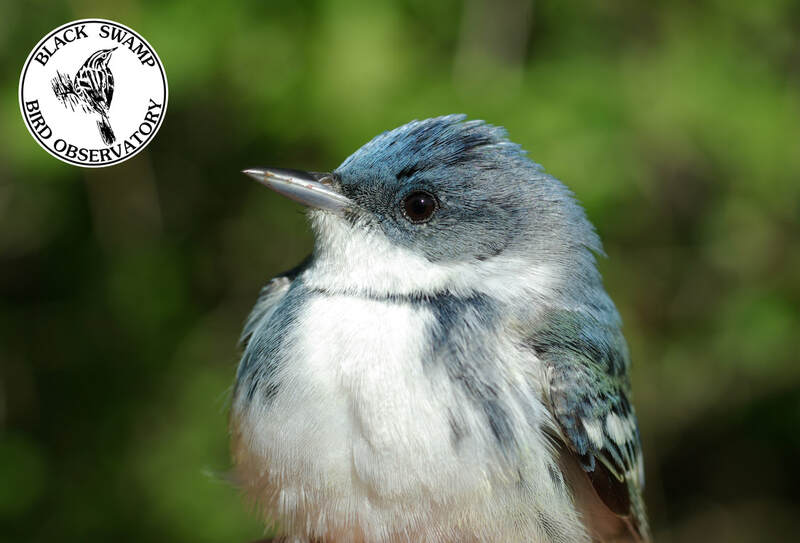 Ohio Migration Fact: The peak capture days for CSWA at BSBO's Navarre Marsh Banding Station are September 25 and May 9. It is unknown why, but CSWAs are more abundant in spring than fall in our area. Peak numbers for spring have been recorded at 231 birds a year and the peak for fall is 38. Cool fact: The Chestnut-sided Warbler molts during migration. The CSWAs banded in BSBO's Navarre Marsh Banding Station in spring will look like a completely different birds in the fall! See the photos for an example of the striking difference. Female Hooded Warbler. Photo by Brian Zwiebel. This male Hooded Warbler is exhibiting distinct behavior opening and shutting his tail, flashing his white outer tail feathers. Photo by Carl Edwards. 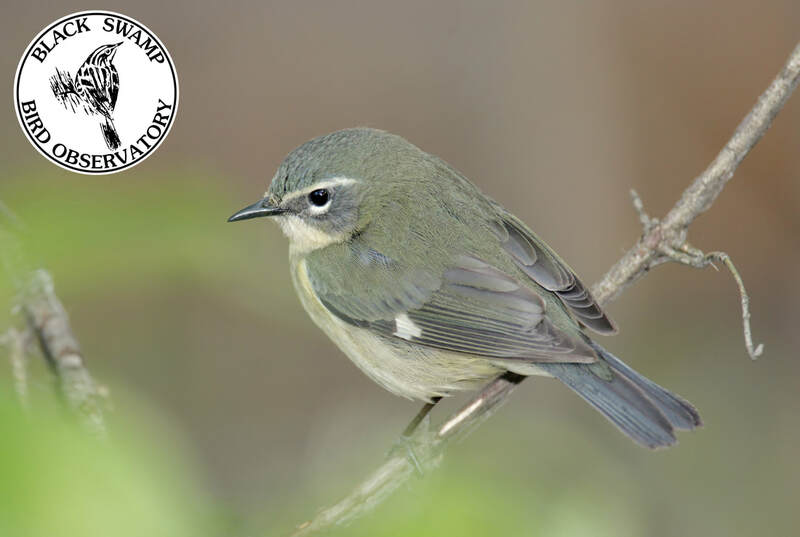 Identifying characteristics: In the forest undergrowth, this skulking warbler seems to call attention to itself by frequently fanning its tail quickly open and shut, flashing the white outer tail feathers. 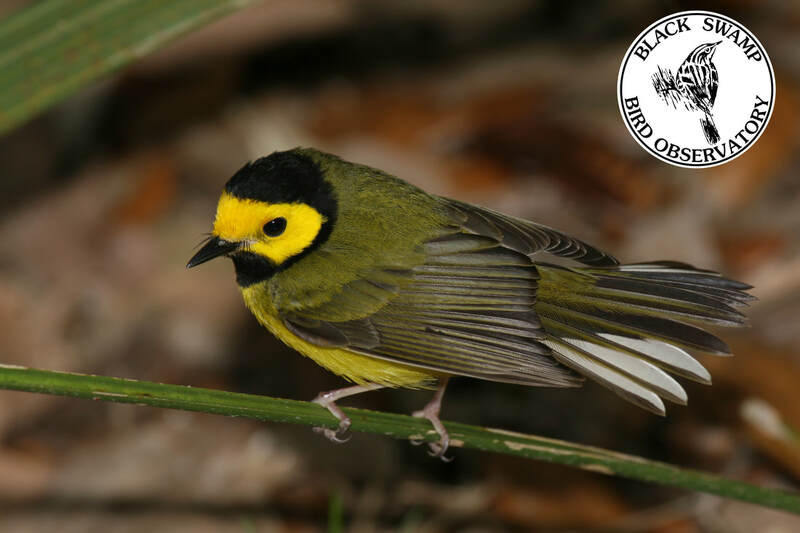 Hooded Warblers are common in moist leafy woodlands of the Southeast. They usually stay low in the shadowy understory, foraging actively in the bushes and nesting close to the ground, although males will move up into the trees to sing. White in outer tail feathers. Male with distinct black hood and yellow mask. Female similar, with only hint of an olive hood. Preferred habitat: Forest ground dweller. Breeds in forest interiors of mixed hardwoods in the north and cypress-gum swamps in the south. During migration, found in deciduous and mixed eastern forests. In winter, males compete for territories in humid lowland forest and females occupy mainly disturbed scrub or secondary forest. Song: Clear, ringing ta-wit, ta-wit, ta-wit, TEE-oh. 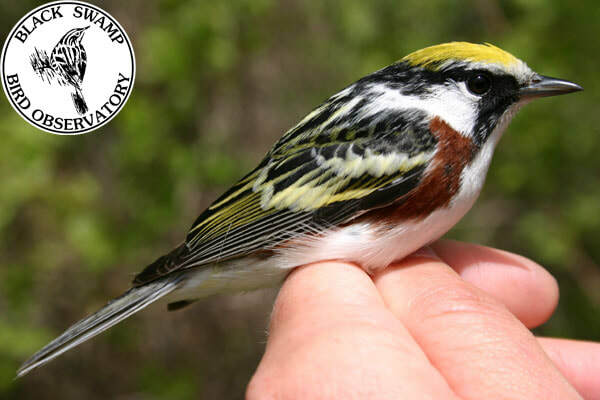 Northwest Ohio migration fact: Only one HOWA was captured at the Navarre Banding Station in the fall of 2017 and none were captured in the fall of 2018. In the spring of 2018, three HOWA were captured, all in the month of May. While HOWA numbers seem to be increasing locally on the edges of its northerly range, along the Lake Erie shoreline, HOWA are considered an overflight species in spring that overshoot their intended destination, generally following strong southerly winds in late April/early May. Cool fact: Will feed on insects by “hawking” (sallying from a perch to catch a flying insect, and returning to the same or nearby perch). Information provided by Lives of North American Birds by Kenn Kaufman and Black Swamp Bird Observatory. Photo courtesy of Brian Zwiebel and Carl Edwards. Identifying characteristics: Yellow underneath with white vent. Gray hood with yellow throat, and white eyering. Rufous cap often concealed. Female slightly paler than male. Preferred habitat: Cool, open mixed woods with undergrowth; forest edges, bogs. Breeds in deciduous, coniferous, and streamside woodlands, also bogs and thickets. Favors cedar and spruce bogs in northern part of range, abandoned fields and mountain pastures with saplings and young trees in eastern United States. Song: A loud, ringing teebit-teebit-teebit, chipper-chipper-chipper; usually have two distinct segments. Ohio migration fact: During spring migration at the BSBO Navarre Marsh Banding Station, 208 Nashville Warblers are banded (on average); peak capture being May 1 with 78 birds. During fall migration, the station sees an average of 40 Nashvilles, with the last capture recorded on October 9. Cool fact: Pioneer birdman Alexander Wilson encountered this bird first near Nashville, Tennessee, and it has been called Nashville Warbler ever since. 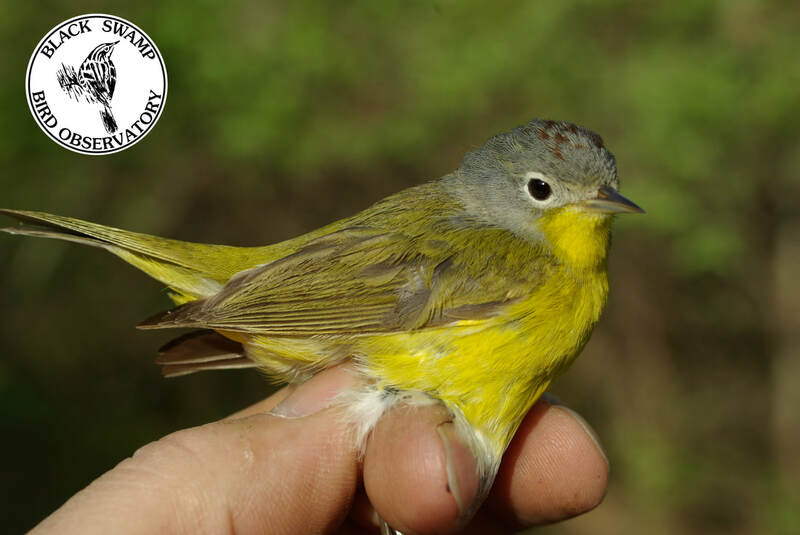 The scientific name of the Nashville Warbler is Oreothlypis ruficapilla; ruficapilla calls reference to the rufous cap that is often concealed. Identifying characteristics: Low forager. Uncommon in east. Overall plain, gray-yellow. Faint, blurry breast streaks. Faint, pale eyebrow and obscure eyeline. Orange crown often concealed. Male and female alike, although adult male shows most orange in crown. Often confused with Tennessee Warbler, Orange-crowned appears stockier with a slightly decurved bill, “smudgy” appearance, and yellow undertail coverts. Preferred habitat: Brushy clearings, aspens, undergrowth. Breeds in shrubby vegetation, usually deciduous undergrowth in various habitats, including spruce forest, fir-aspen forest, streamside thickets, or chaparral with partly shaded ground. Song: Song is a simple trill going up or down the scale toward the end. Call a sharp stik. Ohio migration fact: In the spring, the Navarre Marsh Banding Station averages 11 OCWA. The first documented for the year is April 27. In the fall, the station averages 5 OCWA. The last documented as late as October 18. Cool fact: In winter (when most warblers are deep in the tropics) Orange-crowneds are common in southern states, and they are one of the few warblers that can be seen in our region during the winter! Identifying characteristics: Forest ground dweller. Large and thrush-like with tendency to walk, and heavily streaked breast orange crown bordered by black. Will often pop up when alarmed and flare crown. Male and female alike. Preferred habitat: Near ground in leafy woods; in migration, thickets. Needs large tracts of mature deciduous or mixed forest for successful breeding. Song: Loud staccato song – teacher, teacher, teacher – with geographical variation in emphasis. Flight song, often given at night, is bubbling and exuberant series of jumbled notes ending with the familiar teacher, teacher. 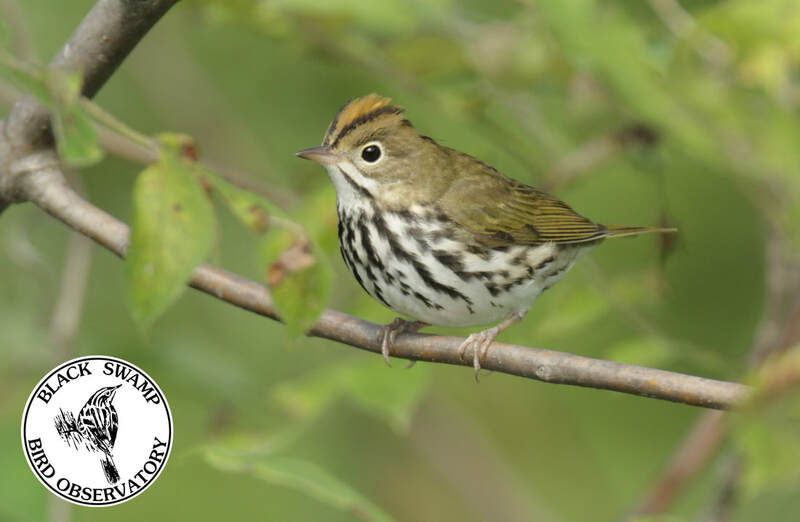 Ohio migration fact: The BSBO Narvarre Marsh Banding Station averages 136 Ovenbird captures in the spring and 77 during the fall season. The first capture of the year is recorded as May 1 and the last is October 5. Cool fact: The name Ovenbird is a reference to the bird’s nest, a domed structure with the entrance on the side, like an old-fashioned oven. The Ovenbird is also the star of the book “One Day in the Woods” by Jean Craighead George and the poem "The Oven Bird" by Robert Frost! Identifying characteristics: Shrub-scrub dweller. Bobs tail. Faint yellow wingbars. Unique chestnut back streaks. Male with black side streaks and eyeline, and yellow patch bordered with black. Female paler with faint face pattern. Preferred habitat: Brushy slashings, bushy pastures, low pines. Breeds in dry old clearings, edges of forest, and sandy pine barrens with undergrowth of scrub oaks, especially on ends of slopes and ridges. Likes thick second-growth of hickory, dogwood, hazel, or laurel with blackberry vines. Song: Buzzy zee-zee-zee, up to 10 rapidly ascending notes. Ohio migration fact: The Navarre Marsh Banding Station has only caught 28 PRAW in the 30 years research has been recorded. The last capture was this fall on September 17. While they may breed in isolated areas in northern Ohio, along the lakeshore they are typically an overflight species. Interesting fact: Audubon reports that there are declining numbers in recent decades. Across much of their range, Prairie Warblers require brushy areas following clearings or fires, and disappear as vegetation matures. Also hurt by cowbird parasitism. Identifying characteristics: Canopy forager. Light underneath, green above. Sharp bill. Male with gray-blue cap and white eyebrow. Female paler and overall yellow-green. Preferred habitat: Deciduous and mixed forests; in migration, groves, brush. Breeds in bogs, swamps, and forests. Prefers openings in second growth balsam-tamarack bogs, or aspen and pinewoods, or edges of dense spruce forest. Nests near slight depressions of boggy ground. During spring migration, mostly in high trees. During fall migration, often lower in saplings, brush, weedy fields. Song: Two to three parts, starting slow then rapidly ascending to trill (like the stuttering of a truck starting). Also described as a sharp, staccato di-dit-di-dit-swit-swit-swit-chip-chip-chip-chip-chip, fastest at the end. Ohio migration fact: In spring at the Navarre Banding Station, the TEWA has an average of 118 captures; peak capture being noted around May 9. In the fall, there is an average of 75 captures with the last being recorded on October 17. Cool fact: This bird is found in Tennessee only briefly during spring and fall migration; but there is no point in giving it a more descriptive name, because the bird itself is nondescript. The male makes up for his plain appearance with a strident staccato song, surprisingly loud for the size of the bird. ​Information provided by Lives of North American Birds by Kenn Kaufman and Black Swamp Bird Observatory. Identifying characteristics: Shares the conspicuous yellow rump and basic plumage pattern with Myrtle Warbler, but breeding male has yellow throat, paler grey head and upperparts, ear-coverts concolorous with rest of head, white eye-crescents but no supercilium, more solid back on breast, and more white in wings and tail. In the adult breeding female, the pattern is the same as the male, but considerably duller. The yellow on crown and throat is paler, tail with less white. Preferred habitat: Breeds in highland coniferous and pine. Uses all kinds of woodland, thickets, and gardens on migration and in winter. Mainly feeds on insects (much more so than Myrtle Warbler). Song: Similar to Myrtle’s, but slightly slower and more deliberate, often sounding more musical. Its call is a short, fairly sharp ‘chep’, noticeable softer and less emphatic than that of the Myrtle. 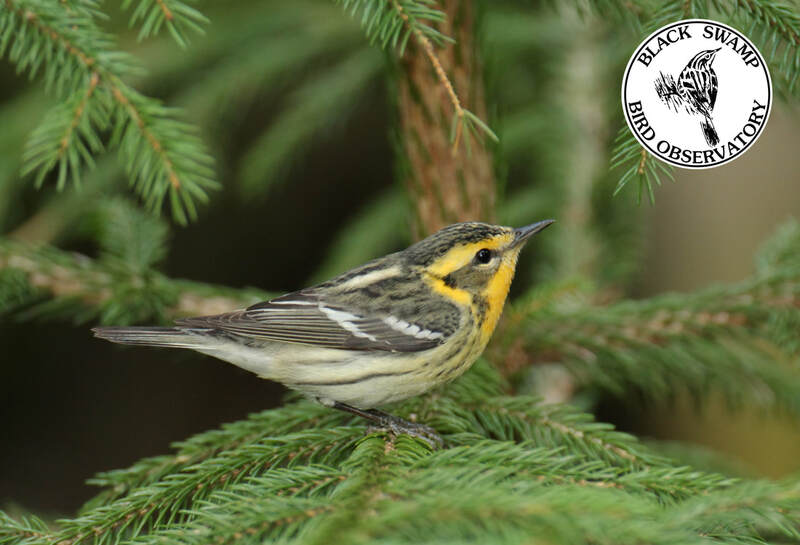 Ohio migration fact: Black Swamp Bird Observatory’s Navarre Banding Station has only ever banded one Audubon’s Warbler! There was one Audubon’s Warbler banded in the fall and there has never been an Audubon’s Warbler banded in the spring. 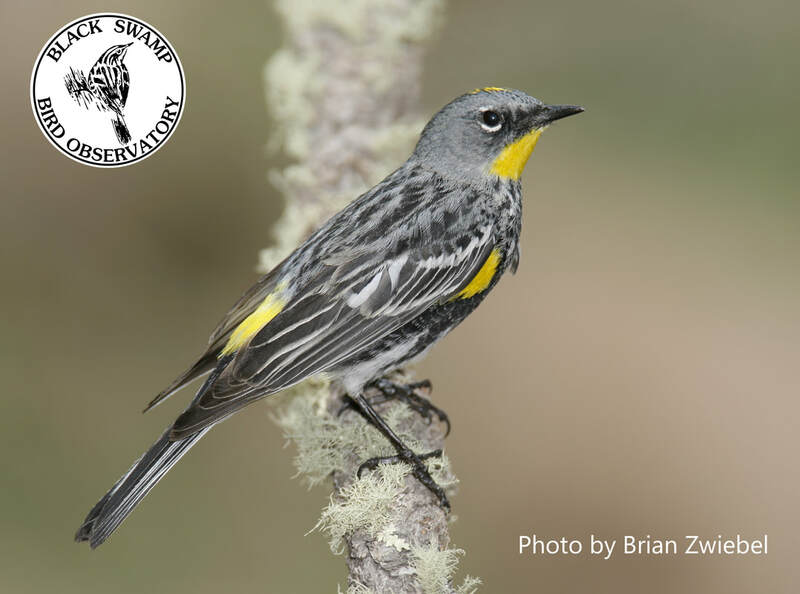 Cool fact: The two main subspecies – the eastern Myrtle Warbler and the western Audubon’s Warbler – were lumped together to create a relatively new species, the Yellow-rumped Warbler. There are other races within the Audubon’s group, and there are also constant differences in plumage, call, song, and habitat preference. Identifying characteristics: Adult male breeding: black ear-coverts, narrow white supercilium, white throat, bright yellow patches on crown and on breast sides, grey upperparts, bright yellow rump. Adult female breeding: Duller than male; upperparts grey-brown, cheeks dark grey-brown, yellow patches (except rump) duller and less conspicuous, underparts with less black. Adult male non-breeding: much duller than breeding, but still with yellow patches distinct, bold black streaks above and below and distinct uppertail-covert pattern. Preferred habitat: Winters in southern North and Central America and West Indies. In habits forest, woodland and edges. Song: A rather flat, slow trill, very variable in intensity, and usually rising (but occasionally falling) at the end. The Myrtle Warbler’s call is a sharp, emphatic and nonmusical ‘chek’ which, once learned, is quite distinct among the warblers. Ohio migration fact: The Myrtle Warbler is one of the first warblers to come through the Navarre Marsh Banding Station in the spring! The earliest capture of a Myrtle recorded is April 11. On average, there are 557 Myrtles recorded in the spring and 305 on average in the fall at the Navarre Marsh Banding Station. Cool fact: The Myrtle Warbler is the northern and eastern representative of the Yellow-rumped complex and is one of the most abundant of all the warblers. It is an early migrant and its distinctive, sharp call is often heard in the north while there is still snow on the ground. Identifying characteristics: Canopy forager, prefers pines and sycamores. Bright yellow throat contrasts with black face. White eye-crescent and eyebrow. Male and female alike. Preferred habitat: Breeds in a variety of southern forest types. In the Midwest, they are typically found in riverside groves of sycamores. On southern Atlantic coastal plain, occurs in old live oaks covered with Spanish moss. In south, lives in pine forest and cypress swamps. In Mississippi Valley, also breeds along streams in bottomland woods, especially of sycamores. During winter, often forages in palm groves. Song: A series of clear ringing notes descending in pitch and increasing in speed, rising abruptly at the end, teeew-teeew-teeew-teeew-tew-tew-twi. 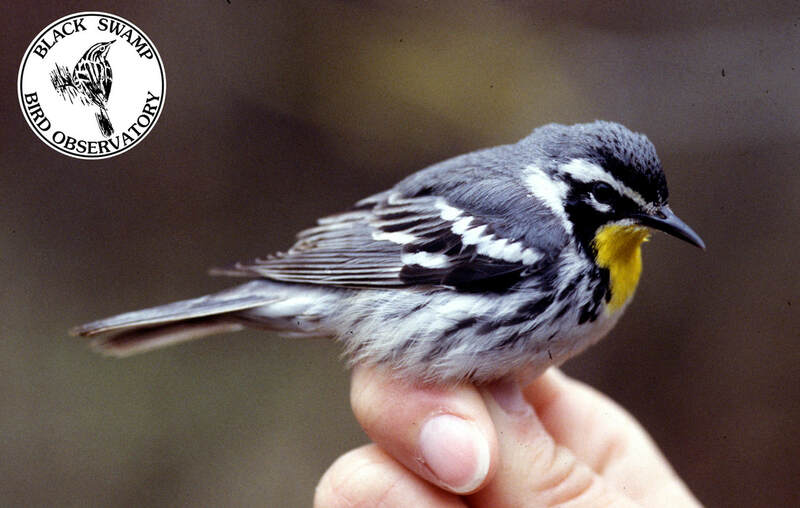 Ohio migration fact: At the Navarre Marsh Banding Station, only one Yellow-throated Warbler has been banded and that was in the spring. Most individuals occurring in the northern part of the state are often over-flights (birds that get caught-up on southerly winds and overshoot their intended destination). Cool fact: Yellow-throated Warblers have been known to occur in early winter in Ohio. The YTWA has undoubtedly disappeared from some areas with loss of breeding habitat, but current populations seem stable.